Home→Products→Press Release→New Fully-Featured Outdoor Water Sampling Station Offers Maximum Protection From Inclement Weather, Wind, External Contaminants and Vandalism. New Fully-Featured Outdoor Water Sampling Station Offers Maximum Protection From Inclement Weather, Wind, External Contaminants and Vandalism. Complete with a weather-tight sealing closure and both wind and rain guards, the EZ-01F outdoor sampling stations provide a more pristine testing environment for evaluating water quality. Ventura, Calif. [JAN 18, 2016] – When verifying water quality, the monitoring of public and private water supplies starts at the sampling station. In order to provide a “clean” sample that is virtually free from external contaminants, American-MC Inc.’s new EZ-01F competitively priced outdoor sampling stations protect the cleanliness of the sampling valve and the water samples it produces. Classically designed to fit any setting, this state-of-the-art sampling station adds beauty to any installation. Between sampling intervals and during the sampling process, the proprietary and patent pending three-position, self-sealing lid works in concert with the EZ-01F’s wind guards to produce the best possible sample. When the lid is closed between sampling intervals, the marine application, stainless steel spring-loaded aluminum lid seals flush to protect the sampling station against weather, infestations and other contaminants from entering the testing chamber. A choice of an integral keyed master lock that are all keyed the same or stainless steel hasp for a padlock is included for added security against vandalism. When sampling during inclement weather, the lid’s second position forms a cover over the sampling area to deflect rain and snow from entering the sample. The EZ-01F’s exclusive side wind guards and lid combine to prevent contaminants from being blown into the water sample. When weather is not a factor, by simply pushing the lid to its lay back third position, it becomes a secure shelf that can hold up to 35 pounds of equipment. This feature frees the technician’s hands so he need only concentrate on the sampling process. The EZ-01F comes complete with both a 1” flushing valve with a 1” port and a 1/4” sampling valve with a ¼” port. Meeting or exceeding all NSF 61 standards, the EZ-01F’s heavy-duty, rust-free aluminum station body has a 10-year guarantee. Unlike carbon steel sampling stations that are prone to rust resulting in a shortened life cycle, the EZ-01F’s all aluminum sampling station body is guaranteed to last for many years of rust free service. Constructed with 3/16” aluminum, the station body’s 44” height simplifies the technicians sampling task. The body width is 8″ X 8” and the station rests on its 11” X 11” pre-drilled base plate for a secure installation at the testing location. Options range from powder coating finishes to a totally custom unit. Powder coating the station body to match a water district’s color code is a very popular user option. To satisfy virtually any color specification, the company offers more than 400 color selections from which users can choose. Also, for those locations that require it, optional marine-quality stainless steel valves can be used instead of the standard brass valves. 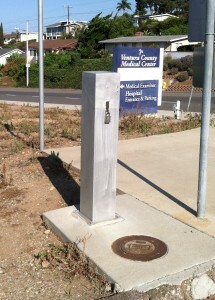 For totally custom outdoor water stations that are built to user specifications, American MC, Inc. welcomes inquiries. American-MC, Inc. manufactures both standard and custom state-of-the-art water-sampling stations. Known as a pioneer in design and manufacture of full-featured, long lasting, rust free and weatherproof outdoor sampling stations that are backed by a 10-year guarantee. The company’s proprietary sampling stations provide a more pristine testing environment for evaluating water quality. Now in their second decade of manufacturing sampling stations, they have sold hundreds of units to municipalities, water districts, and plumbing supply and construction companies throughout the United States.